ATHENS, Greece - Greece's embattled prime minister and main opposition leader agreed Sunday to form an interim government to ensure the country's new European debt deal and oversee early elections, capping a week of political turmoil that saw Greece facing a catastrophic default and threatening its euro membership. Greek leaders had been anxious to end a severe political crisis with some positive result before Monday, when the country heads to a meeting of eurozone finance ministers in Brussels. The initial agreement, which will see Prime Minister George Papandreou step down, came after a week of drama sparked by his announcement he was taking the debt deal to a referendum. He withdrew that plan Thursday after intense opposition from European leaders and his own Socialist lawmakers, many of whom called for him to resign. 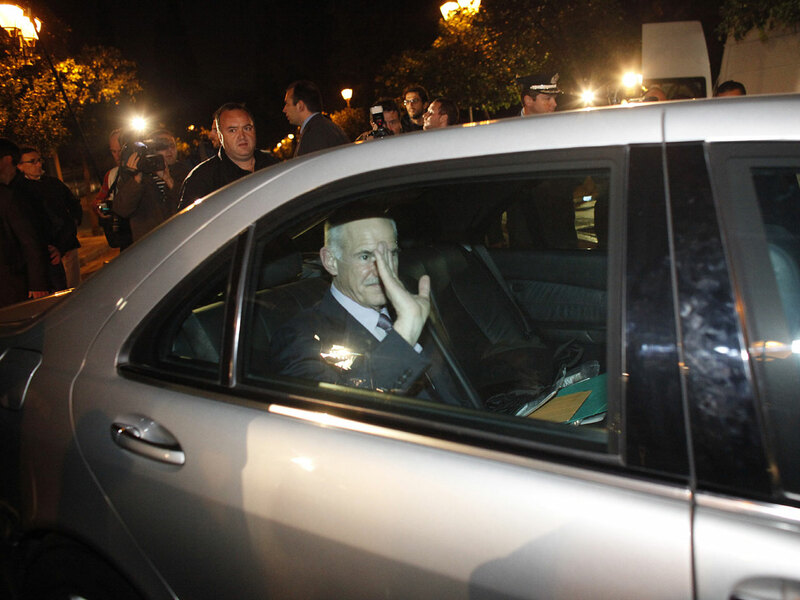 Papandreou "has already stated he will not lead the new government," the statement from the president's office said. He is to meet again Monday with opposition leader Antonis Samaras to seek agreement on who will head the new government and who will be included in its Cabinet, the president's office said. A planned meeting with the leaders of all political parties represented in parliament, which was to take place Monday evening, was canceled after parliament's two leftist parties refused to attend, the office said. The statement came after a late-night meeting between Papandreou and Samaras called by President Karolos Papoulias to end a two-day deadlock. Direct talks had failed to get off the ground as Papandreou had agreed to step aside but only after power-sharing talks settled on a new government makeup, and Samaras insisted he wanted snap elections and would not start negotiations unless Papandreou resigned first. An opposition conservative party official said Samaras' party is "absolutely satisfied" with the outcome of the talks and that party officials were to hold meetings late Sunday night with Finance Minister Evangelos Venizelos and his advisers to discuss how long it would take to finalize the new debt deal and when elections could be held. "Our two targets, for Mr. Papandreou to resign and for elections to be held, have been met," the official said, speaking on condition of anonymity to discuss the process. The crisis was sparked after Papandreou's shock announcement on Oct. 31 that he wanted to put a new European debt deal aimed at rescuing his country's economy to a referendum. That plan caused an uproar in Europe, with the leaders of France and Germany saying any popular vote in Greece would decide whether the country would remain in the euro. European officials also said the country would not receive the vital euro8 billion euro installment of its existing euro110 billion bailout until the uncertainty in Athens was over. Papandreou's announcement also spooked international markets, leading stock markets to tumble and led to calls in Greece for Papandreou's resignation  even from among his own Socialist lawmakers and ministers  with many saying he had endangered Greece's bailout. The prime minister withdrew the referendum plan on Thursday, after Samaras indicated his party would back the new debt deal, which was agreed upon after marathon negotiations in Europe on Oct. 27. Greece has been surviving since May 2010 on its initial bailout. But its financial crisis was so severe that a second rescue was needed as the country remained locked out of international bond markets by sky-high interest rates and facing an unsustainable national debt increase. The new European deal, agreed on by the 27-nation bloc on Oct. 27 after marathon negotiations, would give Greece an additional euro130 billion ($179 billion) in rescue loans and bank support. It would also see banks write off 50 percent of Greek debt, worth some euro100 billion ($138 billion). The goal is to reduce Greece's debts to the point where the country is able to handle its finances without relying on constant bailouts. Greece's lawmakers must now approve the new rescue deal, putting intense pressure on the country's leaders to swiftly end the political crisis so parliament can convene and put the debt agreement to a vote. "We know that there can be no elections now," Papandreou had said during an earlier emergency Cabinet meeting, noting that snap polls would delay the approval of the new debt deal. "This cooperation, however, is necessary and will be beneficial for the climate in our country and internationally." In return for bailout money, Greece was forced to embark on a punishing program of tax increases and cuts in pensions and salaries that sent Papandreou's popularity plummeting and his majority in parliament whittled down from a comfortable 10 seats to just three.